The CC5MPX is a high-quality, high-resolution digital network video camera specifically designed for remote outdoor observation applications. The camera consumes low power, making it ideal for outdoor observation in remote locations using a solar-power battery. The camera can also operate with ac power where ac is available. It has a high-quality and very rugged environmental case that enables its outdoor use in extremes of temperature. It is compatible with Campbell Scientific data loggers. The camera's capture and retrieval modes are highly configurable; camera settings are adjusted through an easy-to-use web interface. The camera can produce still images of up to 5 megapixels and video up to 720p. The camera's image and video capture trigger modes include two independent self timers, or external triggers such as data logger control, motion detection, and web page control, making it an ideal camera for a wide variety of outdoor observation and surveillance applications. An outdoor-rated SD memory card for image storage is available as an option. The camera can send images and video directly to your desktop or publish them to the web via various communications options. Images and video taken by the camera can be delivered to you from remote locations via cellular modem, Ethernet 10/100, RS-232, RS-485, Satellite, and PakBus. You can configure the camera to act a a webcam that publishes images and video directly to a website using various communications devices. The CC5MPX camera is Campbell Scientific’s first high-resolution digital network outdoor observation and surveillance camera with video capabilities. It produces JPG images with a resolution of up to 5 megapixels, and shoots videos with a resolution of up to 720P. The camera can function as a stand-alone camera or can be connected to a Campbell Scientific data logger or another PakBus® device. Several power-conserving modes allow the camera to be used outdoors in remote, solar power battery installations. 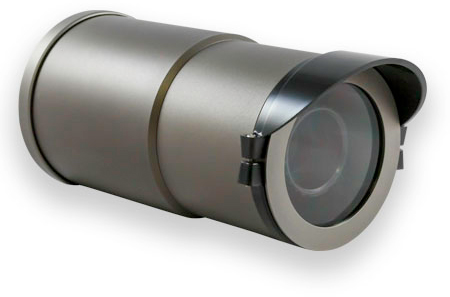 This outdoor observation camera is designed to operate in harsh environments; the camera operates at temperatures as low as -40°C and as high as 60°C. It has an integrated environmentally sealed enclosure that protects the camera from moisture and high-humidity. The camera's high-quality, integrated outdoor-rated enclosure also eliminates the time required to install the camera in a separate enclosure. The CC5MPX camera has several options for image and video acquisition and storage. You can take still images and videos based on an internal timer, motion detection, or a trigger from an external PakBus device (such as a data logger). The images and videos can then be stored on an SD card, saved in a data logger’s memory, sent to a PC via email, or transmitted to an FTP server. -NOTE- Time is from wake-up to start of capture. CR10X (retired) The CR10X must be the -2M version and must use the PakBus operating system. CR23X (retired) The CR23X must be the -2M version and must use the PakBus operating system. CR300 Limited to RS-232 Port with Null Modem, NO USR Drive Capability. CR510 (retired) The CR50 must be the -2M version and must use the PakBus operating system. The 18549 Camera Mounting Kit is used to mount the CC5MPX camera to a CM202, CM204, or CM206 crossarm. The crossarm then attaches to a tripod, tower, or user-supplied pole (1.0-in. to 2.1-in. outer diameter). The bracket’s design facilitates the aiming of the camera. The CC5MPX camera is compatible with any PakBus data logger that has 2 MB or greater of on-board memory. The data logger must have a current operating system. Can the CC5MPX be powered via PoE? PoE, or Power over Ethernet, is commonly used as a way to power devices and equipment using the unused conductors in a standard Ethernet cable. To accomplish this, there must be a sending device, or power source equipment, as well as a powered device. The CC5MPX family of cameras does not work with PoE. For the family of CC5MPX cameras to be powered, a separate accessory, the CC5MPXCBL1-L cable, must be used to provide both power and RS-232/RS-485 communications.